I am thrilled to hear that one of my favorite lines has come out with a blush made from clay baked in the sun by the Amazonian River. 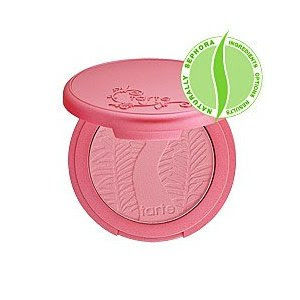 Tarte's new Amazonian Clay 12-Hour Blush has hydrating properties while at the same time helps to minimize unwanted shine. The texture of this blush is somewhere between a powder and a cream (perfection?) and it has some serious staying power. Amazonian Clay 12-Hour Blush contains vitamin A, C and E, on top of being naturally nutrient-rich. These extra benefits will keep skin moisturized, improve tone and elasticity and assist in removing oil on skin's surface (which in turn will help foundation last longer). This lovely new addition to tart's line comes in 8 gorgeous shades that range from bright pink to coral and can be found at Sephora.